Time Moves With The Moon : 13.7: Cosmos And Culture Our lives are based on conventions that seem rock solid when they aren't, at least in comparison with cosmic time-scales. The duration of a day changes in time, determined by the gyrations of the Earth-Moon pair. 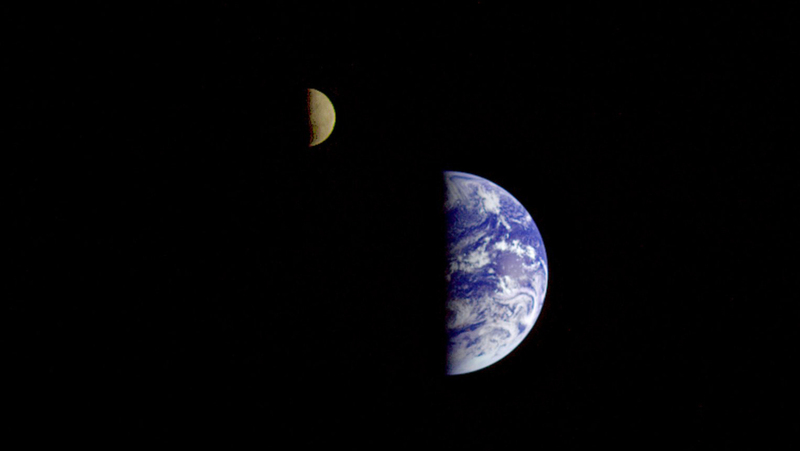 On its way to Jupiter, the Galileo spacecraft looked back and captured this remarkable view of Earth and the moon. The image was taken from a distance of about 3.9 million miles. According to the latest theories, the moon was born from the Earth, its matter torn off when a Mars-size planetoid hit the Earth in a grazing collision some 4.5 billion years ago, when the Sun and its court of planets were emerging from a contracting and spinning hydrogen-rich primordial cloud of matter. For those who enjoy Biblical references, as Eve was born from Adam's rib, so the Moon was born from the Earth's innards. And the pair have been playing with each other ever since, in ways that deeply influence our lives, even if we remain mostly unaware of their trickery. The torn-off plume of matter slowly coalesced into what would become our only natural satellite, fated to orbit the Earth due to gravity's inexorable action. Planets and satellites have their dynamics interlinked since their mutual origins. Given that the moon emerged from Earth, their distance was once smaller. Simulations place the initial distance at about 10 Earth radii, while now it is at about 60, a huge difference. So, if today the full moon occupies an area in the celestial sphere comparable to that of your thumb nail (about 0.5 degrees), in the distant past the view was considerably more dramatic. Also, since the gravitational force varies with the square of the distance, in the past the mutual influence of Earth and moon was much larger. Today, the most obvious effect of this attraction is the tides, two high and two low a day. (The Sun also plays a role in the tides, but we will leave it aside.) Actually, the tidal effect varies with the cube of the distance, which means that in the past tides were positively huge. Very roughly, if the distance decreases by a factor of 6, as simulations estimate was the case when the moon was forming, the tidal force increases by a factor of 216. In practice things probably weren't as dramatic, but it is fair to estimate that billions of years ago tides could have reached many hundreds of feet. The Earth's crust, being then much more malleable, would heave periodically by as much as 200 feet. As the Moon moved away from the Earth (currently at about 4 centimeters per year), the tides gradually quieted down. This enormous tidal effect caused (and still causes) a drag in the Earth-moon system, dissipating much of its rotational energy. As a consequence, the moon's spinning slowed down so that its rotation rate is the same as the time it takes to go once around the Earth—and that's why we only see one side of the Moon—while the Earth's spinning diminished considerably: days were shorter in the past. People often wonder if time has been in a hurry as of late. The answer is no: a minute is a minute, and will remain such for as long as we stick with the sexagesimal system for hours, minutes and seconds. What does change, however, is the duration of a day, even if absurdly slowly for human standards. As of now, a day becomes longer by about 1.7 milliseconds per century. At this rate, half a billion years ago a day lasted a bit over 22 hours and one year had 397 days. Consider how different our musings about time and nature would be if this were our present-day reality. An amazing consequence of this is that there would be no more total solar eclipses, since they result from a coincidence: the areas occupied by the moon and the sun in the sky now are the same, given their relative distances and sizes. Our lives are based on conventions that seem rock solid when they aren't, at least in comparison with cosmic time-scales. The duration of a day changes in time, determined by the gyrations of the Earth-Moon pair and the incessant workings of the gravitational force. Two corrections have been made to this post. 1. The rate of increase for a day should have read 1.7 milliseconds and not 1.7 microseconds. 2. When the Earth and moon are tidally locked, one day will last 47 of our present days.